After a long stretch of abysmal film making, Schwarzenegger is returning to his roots by revisiting all the great characters that made him famous in the first place. Now well over fifty, some might say that this is the time in his career when he should be moving away from playing nothing but big muscled heavies. But, with Terminator 3: Rise of the Machines Arnold proves that age hasn't changed a thing. I saw T3 in an audience full of bikers. Here's a revelation: Terminator is really popular with bikers. So, someone must have hit the Harley shops and handed out tickets to see it with the press. You haven't lived until you've seen the local weatherman wedged between two leather clad biker boys. Luckily, T3 has the goods to keep both rowdy bikers and bespeckeled news anchors happy, with a non stop slate of action mixed into the same head tripping destruction of the previous two Terminator films. This time, the enemy is a female Terminator, played by statuesque model Kristanna Loken. Sent back in time to kill John Connor and others who lead the future human resistance, she hunts her prey with robotic efficiency and almost human-like cunning. Loken does admirably in her debut, bringing back fonder memories of Schwarzenegger's first stint as the original T-800. Loken's Terminator, dubbed the T-X , is far beyond the simplistic design of the original. She has a host of new gadgets in her arsenal, which seem to blend the abilities and styles of the T-800 with that of his Terminator 2 opponent the T-1000. 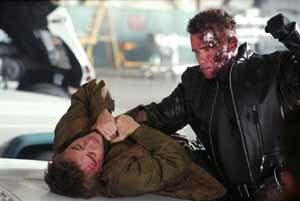 As in T2, the only thing standing between Connor and death is yet another T-800 Terminator (Schwarzenegger). Sent back in time by benefactors from the future, Arnold's character first appears as he always does, naked and alone. Schwarzenegger, now 55, pulls off the same amazingly cut body he had over a decade ago. He hasn't aged a day. In a movie packed with stunning visuals, that is perhaps the most amazing achievement of all. However, this Terminator has left behind many of the elements which made the first a success. John Connor is now a man. That means he doesn't need mommy anymore. As a result, Linda Hamilton, linchpin of the previous movies is not on board. Nor is director James Cameron, whose big movie skills have been the driving force behind all that is Terminator since the very beginning. With Cameron refusing involvement, the reigns were turned over to U-571 director Jonathan Mostow, because let's face it, the only person you absolutely need is Arnie. This story, as it did in the previous film, revolves around John Connor. We're left delving into the questions Terminator 2 didn't answer. Was Judgement Day averted? What does the future hold for mankind? But the star of this Terminator movie, as in the others, remains the Terminator himself. Arnold has not lost a step. He's every bit as menacing, powerful, and flat out dangerous in the role as he ever was. My only minor quip with his fantastic performance is that perhaps this Terminator, and this movie in general, has become just a little too self aware. It's obvious that when this T3 script was written, it was written with a strong knowledge of the place this character holds in the minds of moviegoers, and as a part of pop culture in general. That's reflected in the Terminator himself, who has, compared to his stoicism of the first film, become a bit of a chatterbox. Still, that's only a tiny reflection in an altogether fantastic movie sequel. Mostow has taken great care of Cameron's baby, carrying his irreplaceable legacy smartly into the future. In some ways, he even tops Cameron's vision, delivering bigger, badder action set pieces which spit in the face of today's cgi-centric movie development. When Mostow wants to destroy a building... he DESTROYS a building. He doesn't build an animated version in cyberspace for an animated Arnold to blow up. When the movie DOES go to digital wizardry, it does so with a flair and style that makes the transition almost unnoticeable as any different from the detailed reality of the rest of the film. The result is a marvelous mish-mash of insanely explosive mayhem. In particular, there's hyper-destructive chase scene in which the T-X does more damage to LA than the last four earthquakes combined. It'll leave you gasping for breath. These filmmakers seem to have a wonderful grasp on just how much havoc two nearly invulnerable cyborgs can truly wreak on each other... and all the rest of us. For me, what sets T3 most firmly on high, are the human dimensions it keeps within the story. Often, sequels, particularly those in which the original creators are not involved, get so caught up in trying to give us more explosions and bigger action, that humanity is lost. Nick Stahl, who replaces Eddie Furlong as an adult, vagabond version of John Connor,doesn't have a ton of romantic chemistry with his costar Claire Danes. But there is a strong element of shared humanity between them. A survival instinct which both express while dealing with the shock and pain of their crumbling place in human society. Their characters make this more than just another tale of man Vs machine. Instead we're watching the future unfold. This script is every bit as smart as the people involved in it. The plot is tight and the story is a bender, resulting in an inevitable outcome that leaves delicious questions of predestination and man's ultimate demise to bobble around infinitely in our under-used heads. Mostow nails every aspect of it, doing a skilled recreation of James Cameron's past Terminator style in a clear cut homage, while staying relevant to current cultural trends. The only thing really missing is T2's highly identifiable music, replaced with something far less involving. Why they chose to save that familiar Terminator theme until the credits is a mystery. A big movie like T3 could have used a better orchestral boost than the muted background scoring that most of it has been given. In a lot of ways though, this is a much darker movie than the previous Terminator incarnations. John Connor seems lost and in denial about his destiny. Hope seems a much bleaker thing. Throughout there's this continual sense of inevitability, so that even when the good guys are winning... it still seems like everything is sliding downward toward some inescapable and truly horrible conclusion. I love that this movie, more than the other two is not afraid to do that. Is not afraid to face truly horrible questions that maybe we'd all be better off not facing. Most of all, I love the way John Connor can't really deal with any of it, any more than we could. Terminator 3 has defied all expectations. The first two films are undeniably classics. The third may not quite reach that, but comes wonderfully close. The great lumbering Schwarzenegger beast has come back to stomp us flat. Forgotten are all the years of half-baked, terrorist fighting fireman and coldly done trips to hell. 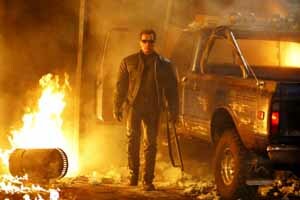 Revisiting the Terminator was the right decision for Arnold and a great movie experience for us.